The Coiled Launcher (サイコジャンパー?, lit. : "Psycho Jumper") is a treasure in Pikmin 2. 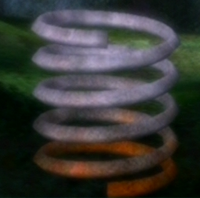 It is actually a rusted spring. This treasure is found on sublevel 3 of the Subterranean Complex, where fire geysers and a few Armored Cannon Beetle Larvae are the only hazards. There is also an Ivory Candypop Bud to use. If all the enemies are near each other, use a leader to lure them into destroying each other with their rocks; if not, throw Pikmin on carefully, making sure the beast is facing away from any edges. The Coiled Launcher is located at a random location on the level. It is presumably a reference to the Gravity Jumper in the first game. Artwork of the Coiled Launcher. The Coiled Launcher being analyzed. A real world rusty spring. This page was last edited on December 12, 2018, at 11:48.